Hugh O’Beirne took the Oath of Allegiance to the United Irishmen but does not seem to have been penalized for his association with the society in the aftermath of 1798: in the years before his death in 1813, he was a Justice of the Peace for Roscommon. He was succeeded by his son Francis, likewise a J.P. and also Deputy Lieutenant for County Leitrim. In 1843 he enlarged the small Catholic chapel built by his father for the people of Jamestown; behind this Francis also erected a school and schoolmaster’s house. 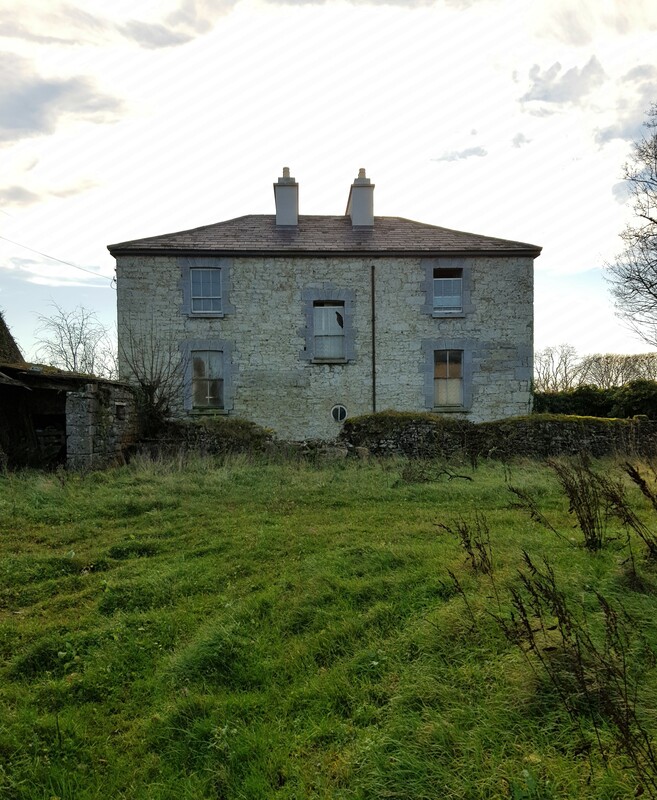 On his death in 1854, the estate – which at its height ran to over 7,500 acres in County Leitrim (and almost another 250 in neighbouring Roscommon) – passed to his son Hugh. His children seem to have been the last of the O’Beirnes to have lived in Jamestown, one son, likewise called Hugh, entered the British Diplomatic Service and along with Lord Kitchener drowned when the vessel they were on, HMS Hampshire, was sunk by a German U-boat off the Orkney coast in June 1916. The house shown in today’s photographs, Tinny Park, County Roscommon, was until recently owned by a branch of the same family. It is believed to date from around the mid-19th century and is a typical gentleman farmer’s residence, complete with handsome yard to the rear. Of two storeys over basement with a central door approached via a short flight of stone steps, the interior conforms to the usual country house plan, albeit on a small scale: double doors to the rear of the two main reception rooms lead to smaller spaces, and the entrance hall is largely taken up by a staircase. 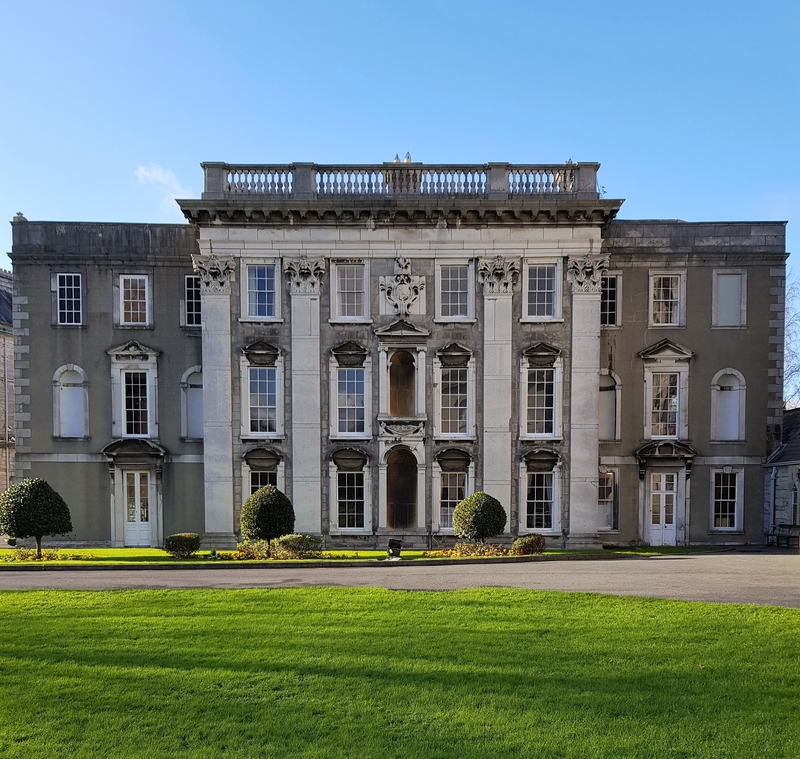 Unoccupied for the previous ten years, Tinny Park was offered for sale for the first time in the summer of 2016, the price on just over six acres was a modest €250,000. It duly sold and, evidently, refurbishment work began, not all of it advantageous: old photographs show the exterior covered in render, all of which has been stripped away. This work now looks to have stalled and when visited last winter the house wore a forsaken appearance. One can only hope that restoration has since resumed (and that in due course the exterior will be correctly re-rendered). 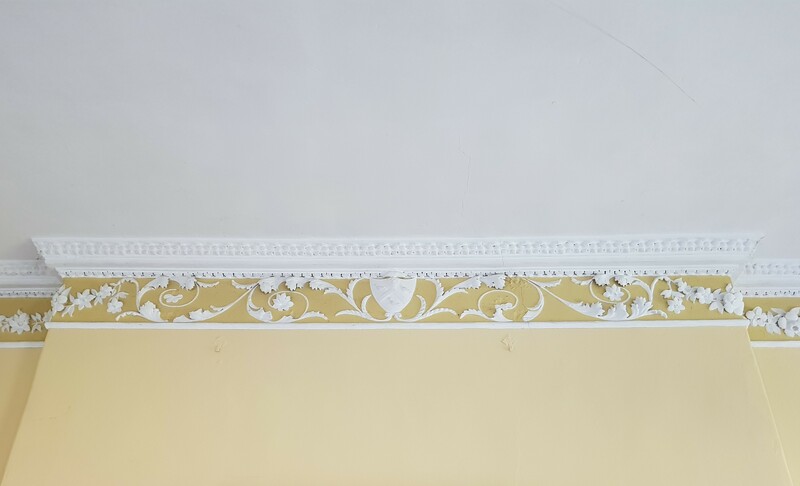 Details of a frieze below the cornice in the drawing room of Newpark, County Sligo. The main part of the present house dates from the last quarter of the 18th century when it was built for the Duke family, which had originally settled in this part of the country in the early 1660s. Much of the decoration of the frieze is in typical late-rococo style, garlands of flowers and leaves scrolling across the surface, intermittently interrupted by urns. But references to the family occur, such as the shield featuring a chevron and three birds, and on another section a coronet from which rise three ostrich plumes. The coronet may be a pun on the Duke family name, but more likely represents the coat of arms of Lucinda Parke, wife of Robert Duke who was responsible for the construction of Newpark. Tribes on the march, planets in motion. Cools down with memory, disperses, perishes. Women’s dresses, dewy lilacs, a song in the valley. And Yet the Books by Czeslaw Milosz. The former Brockagh National School in County Leitrim. Located outside the village of Glenfarne, this opened to pupils in 1885 and is typical of the buildings then being constructed for this purpose and would originally consisted of a single room (later divided into two). Seemingly closed in the 1970s when a new school was built and several smaller establishments amalgamated, like so many others across the country it has since fallen into ruin. The last Wynne to live at Hazelwood left in 1923, after which the house stood empty for seven years. It was then bought by a retired tea planter who carried out essential repairs before selling house and estate to two government bodies, the Forestry Department and the Land Commission, the latter assuming responsibility for the building. In 1946, after serving for some time as a military barracks, Hazelwood and the immediate surrounds were offered for sale by the commission with the condition that a buyer must demolish the buildings, remove all materials and level the site. 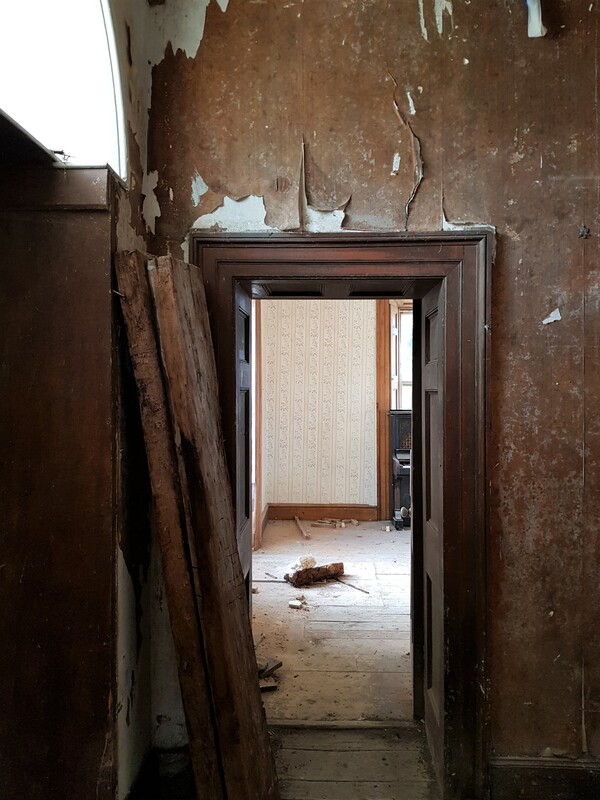 Somehow, days before the auction was due to be held, this stipulation was withdrawn and Hazelwood sold for use as a psychiatric hospital; it was shortly afterwards that the original staircase was taken out of the house. As if this wasn’t bad enough, in 1969 an Italian company called Snia which produced nylon yarn bought Hazelwood and built a factory for some 600 employees. It would have been perfectly feasible for the business to have erected these premises on a site out of view of the old house and screened by trees, thus preserving the Arcadian parkland created by the Wynnes. Indeed one might have thought the relevant planning authorities in Sligo County Council would have insisted this be the case. But instead the factory, surrounded by an expanse of tarmac, went up just a couple of hundred yards to the rear of Hazelwood, covering a space of no less than six acres and thereby destroying the house’s setting. In 1983 the business closed down and four years later the factory was sold to a South Korean company which produced video tapes; this too went out of business. The following year Hazelwood was sold to Foresthaze, a consortium of predominantly local businessmen and in 2007 they applied for permission to build 158 detached houses and 54 apartments in four blocks (in their defence, they also intended to sweep away the factory). This application was refused by the local authority, litigation among members of the consortium ensued, the recession arrived, Foresthaze went into receivership and – when I visited six years ago – the future of Hazelwood looked extremely bleak. In late 2014 Hazelwood and some 80 acres was acquired by new owners who possess both vision and financial backing to ensure the place will have a viable future. The proposed scheme sees a whiskey distillery (for a new brand called Athrú) installed in part of the former factory, much of the rest of this enormous site to be deployed as a visitors’ centre and storage facility: the building’s location, surrounded by water on three sides of the peninsula, makes it perfect for a distillery. As for the house, this is to be restored to serve a variety of purposes, all intended to engage with people who come to see Hazelwood and enjoy its new facilities. Already essential conservation work has been undertaken: the west wing, inaccessible six years ago, has been re-roofed and its interior cleared. From attic to basement, dry rot in sections of the main house has been tackled and water ingress stopped. The building is now stable and, while it may still not look too lovely, a further programme of restoration work is planned for the coming years. This looks like being a long-term project, and the better for that: jobs undertaken too fast often prove to be faulty. The owners’ aspiration is that when everything is complete (and that includes tackling many outlying buildings around the former estate) Hazelwood will attract some 200,000 visitors annually. Athrú is an Irish word meaning change or transform. Thanks to this ambitious scheme the future of Hazelwood looks changed and its transformation has begun. One of the most significant restoration projects in Ireland over recent years has involved not a grand country house or an important public building, but a modest retail premises in central Dublin. We retain so little material evidence of our commercial history that it is difficult to imagine the vibrant economic life of the country in former centuries. That is why the restoration of 3-4 Parliament Street deserves applause. The thoroughfare was opened up by the Wide Street Commissioners in 1762 in order to provide a suitably grand approach from Essex Bridge to Dublin Castle. Almost all the houses lining the street have undergone considerable change over the past 250-plus years but this building retains its original appearance both inside and out, having served for much of the intervening period as Read’s Cutlers. The interior of Read’s has altered little since first being fitted out in the 1760s. The ground floor shop, where once swords, as well as knives and forks were once sold, still contains its original counters, display cases and fitted wall cabinets, while upstairs is laid out as a family residence. Some years ago, the building having lain empty and neglected, this was all at risk of being lost but thankfully Read’s latest owner Clem Kenny appreciated its value and engaged in a through and meticulous restoration, a private initiative for which he deserves universal applause and appreciation. Next Thursday, November 15th, Dublin Civic Trust – which has long engaged in similarly valiant enterprises – is offering a tour of Read’s for which tickets can be booked on eventbrite.ie Rather than spoil the surprise of what lies behind that modest façade, these pictures are intended simply to whet appetites. Anyone who has not yet had an opportunity to see inside Read’s is urged to do so (and thereby also assist the Dublin Civic Trust’s worthy work).